﻿If you are looking at this, it is probably because you read about it in the article Frank Uhle created for Ugly Things magazine that features me. In consultation with Frank, I'll post things here that I hope you will find fun and interesting. 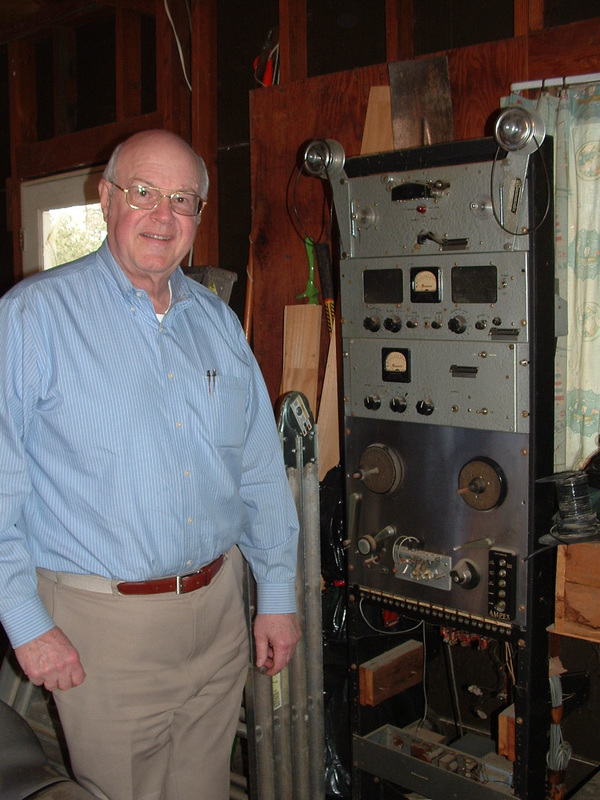 This Magnecorder and its 19 inch rack were in WSLN's control room in 1965. 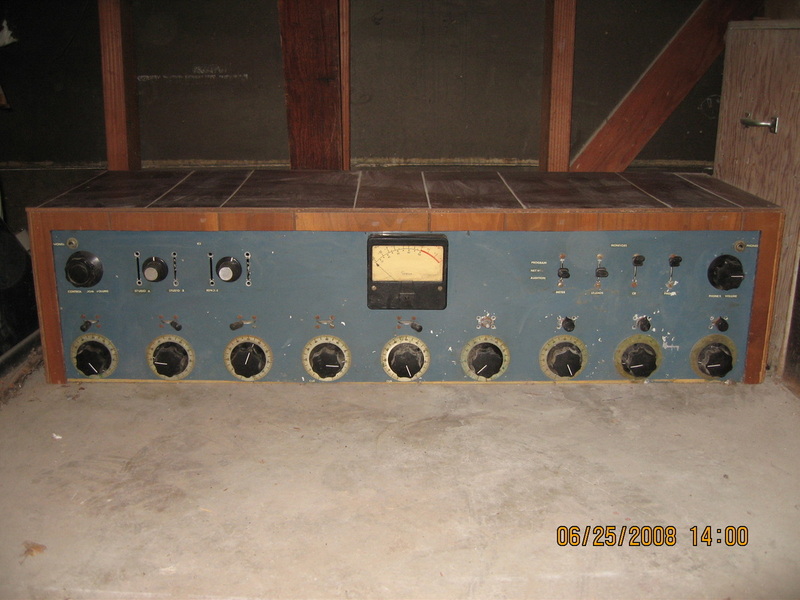 Along with an Ampex 601, they were used to record "Rufus Rastas"/"Donna" by The Continentals. I retrieved the Ampex 400 deck from a dumpster at Motown. My dad, a skilled machinist, helped me fit it with an inexpensive induction capstan motor. I mounted 4-track erase/record and playback heads, and hand built playback electronics using a circuit from the GE Transistor Manual. Signals to drive the erase/record heads were diverted from a separate, portable tape machine. This tube-based 9-channel mixer from WCBN was generously bequeathed to me in 1967, by engineers who had just installed a solid-state replacement. A switch for each input channel assigned it to either Program or Audition output channels. I called the outputs "Left" and "Right", and replaced 4 input switches with pan pots. The modified mixer could then mix outputs of the 4-track tape machine shown nearby to stereo. A custom-built power supply for this mixer, also bequeathed by WCBN engineers, is visible at the bottom of the rack that holds tape machines. I had the good fortune to study electronics in high school. In the early '60s, I passed the test for an FCC First Class Radiotelephone Operator License. At the time, radio stations were required to employ such a license holder to log a few transmitter meter readings every half hour. I was happy to perform that task for a little money. There was plenty of time for studying in between readings. I welcomed the arrangement through the rest of my high school and college years. Of course, station managers preferred that I do some useful work besides reading meters. To the extent that useful work combined my love of music with my technical interests, I was all for it. I found myself increasingly involved in on-air activities, which I greatly enjoyed. I arrived in Ann Arbor September, 1966 to study electrical engineering at the University of Michigan. I soon sought out WCBN, the campus radio station. I did a few shows, recorded some commercials, and produced station jingles that Frank tells me are sometimes used even now. Later on, I found part time work at local AM station WAAM, where I read meters and did on-air duties. When I arrived at WAAM, I wanted to do a show featuring "progressive" music that I felt was underrepresented. I had visions of a syndicated show I called "Strobe," and had created a demo tape. I shopped it around a little with no luck. After some months of pleading and wheedling, WAAM agreed to let me do Strobe Saturday and Sunday nights after midnight. The station's daytime format was middle-of-the-road, but rock-oriented in the evenings. Each hour began with an oldie, included current hits, picks, and album cuts. Phil Robbins, Program Director, was an amiable fellow. He seemed supportive of my brand of on-air fun, and allowed some leeway for it. My college years began September, 1963 at Ohio Wesleyan University. I was delighted to find they had a campus FM station, WSLN, where I could pursue my radio interests. That included interviewing several celebrities who visited the campus. I also found part time and summer work at WMRN in nearby Marion, and at WDLR, a local AM station. My archives have only a few station breaks from WMRN, and short air checks from WDLR and WSLN. I arrived at WSLN shortly after my summer's work at Motown. When offered some air time there, guess what I decided to play! This brief air check, sitting in one morning for another DJ, burnished my resume enough to land me an on-air gig the Summer of 1966 at WQTE AM. It served the Detroit market from studios in Monroe, MI. They even put me on display in a broadcast booth in the Henry Ford museum at Greenfield Village.